This is an ultra cool US trilobite. It is a beautiful Olenoides trispinus from Millard County, Utah. 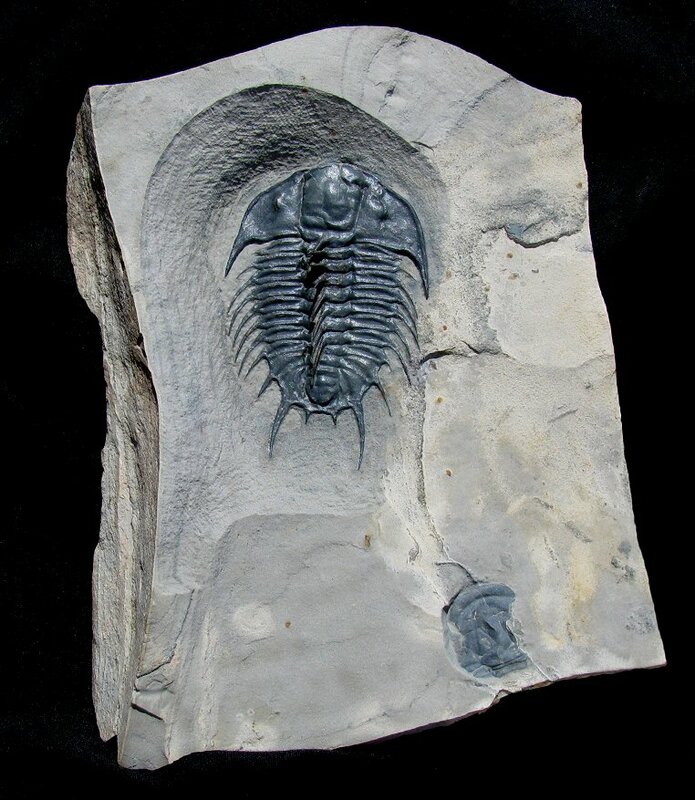 This trilobite was found by Eugene Thomas in 1996. This trilobite was split out in two pieces, with the occipital and axial spines still in the counterpart. The top rock was then secured together with the bottom rock that contained the trilobite, making the trilobite essentially whole again, but still encased in rock. The bug was then microscopically extracted down through the entire top rock to expose the trilobite, spines and all! Not only have the long back spines been preserved on this trilobite, they have even been prepared free-standing! (Yes, these spines are REAL!) Only a handful of this type of trilobite has ever been found this nice, and this is one of a select few ever prepared with axial spines free-standing - only an elite few preparators in the world could do this delicate work. And the fact that the plate is unbroken and has natural, unsawn edges makes this piece that much more incredible. This is simply a beautiful example of a rare Olenoides trispinus that is about as impressive as it could possibly be.